When he was eleven, Mitchell Hogan was given the Hobbit and The Lord of the Rings to read, and a love of fantasy novels was born. He spent the next ten years reading, rolling dice, and playing computer games, with some school and university thrown in. Along the way he accumulated numerous bookcases filled with fantasy and sci-fi novels and doesn’t look to stop anytime soon. His first attempt at writing fantasy was an abysmal failure and abandoned after only one page. But ideas for characters and scenes continued to come to him and he kept detailed notes of his thoughts, on the off chance that one day he might have time to write a novel. For ten years he put off his dream of writing until he couldn’t stand it anymore. He knew he would regret not having tried to write the novel percolating inside his head for the rest of his life. Mitchell quit his job and lived off dwindling savings, and the support of his fiancé, until he finished the first draft of A Crucible of Souls. He now writes full time and is eternally grateful to the readers who took a chance on an unknown author. A Crucible of Souls won the 2013 Aurealis Award for Best Fantasy Novel. 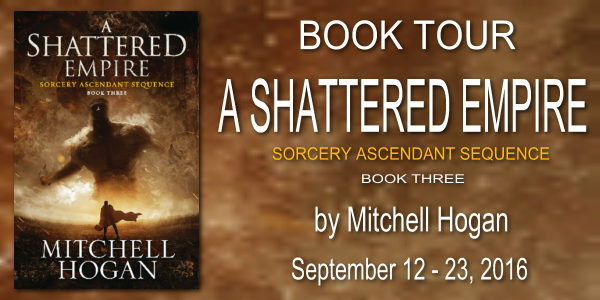 Mitchell Hogan is giving away a paperback copy of Books One and Two of the Sorcery Ascendant (A Blood of Innocents and Crucible of Souls)! This giveaway ends midnight September 23. Winner will be contacted via email on September 24.